They are two entirely different materials. The one on the left, the Light Runner Tech, is made with Coolmax. 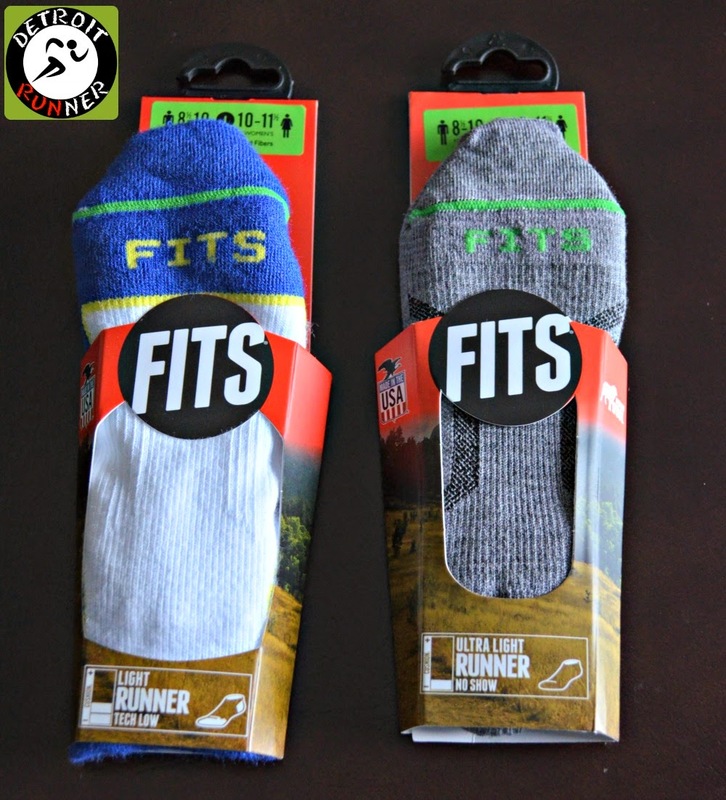 The one on the right, the Ultra Light Runner, is made with Merino Wool. I'm always one to try out new products if they fit with the blog and these certainly fit since they are geared towards runners. I also love trying out new brands of socks even though I have socks that I enjoy. Maybe I'd like some new ones better? 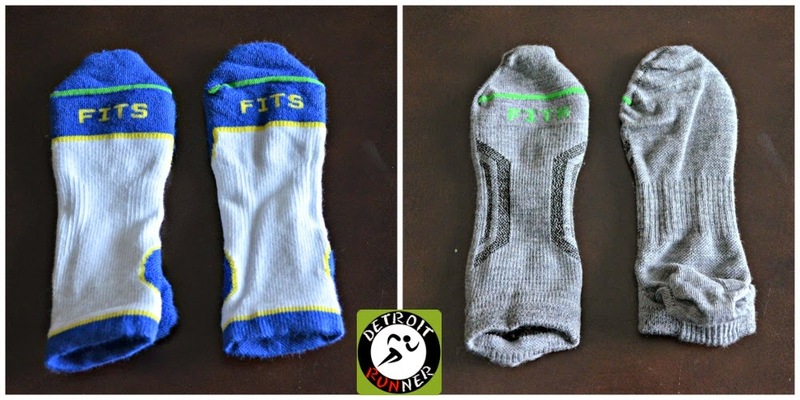 Unfortunately, in this case, while I can applaud the company for making the socks with the right material for runners, they did not work for me. Here's a couple pictures that sum up why they were not for me. As you can see they have a very unusual shape to them. That in itself is not really a big deal for me as long as they fit my foot correctly. The issue that I had with them was how they actually fit on your foot. They are comfortable in the heel. 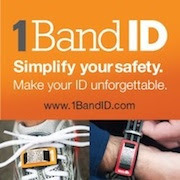 They are comfortable around your foot and stay in place. They are NOT comfortable by the top of the toes. As you can see below, when I put them on, because of the odd shape, there is quite a bit of extra material there. While I cannot really say why they designed them this way, I can feel it while running. I don't want to feel like I'm wearing socks when running. I want my socks to be comfortable and feeling extra material leads to blisters. Blisters are not my friend and therefore, they didn't work for me. 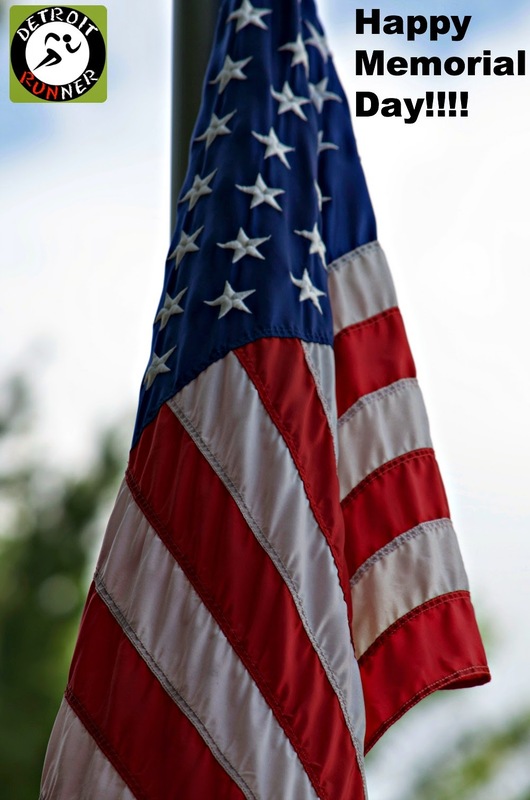 On a positive note, I love that they are made in the USA. Retail price is $14.99-17.99 depending on style. Interested in learning more about socks? Maybe they will work for you? Disclosure: I received two complimentary pair of socks in exchange for this review. All opinions are my own and I was not required to give a particular opinion other than an honest one. The trail starts out easy enough. 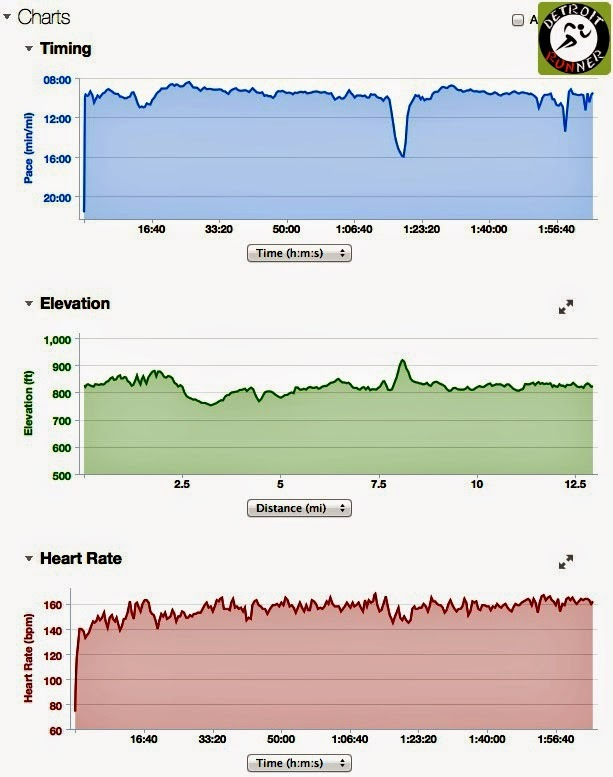 In fact the first couple miles are not really that hilly but it does get hillier after that. It's got a nice mix of hardwoods, pines, and open areas to give it some nice variety. There are a ton of turns on this course as you will see by the map below. I felt like I was turning a bunch. It was not a highly technical course but the turns seemed to make it harder. I really love running on pine needles as it gives you such a soft feeling. Near the end, you even got a nice view of a pond as well. Nice pond at the end. I ran the course twice plus a few extra miles. Overall, a really enjoyable run and I'll be sure to get out there numerous times when I'm back up north since it's so close to the cottage. Race #72 and Half Marathon #25 - Wohoo! A milestone half. A great race! I love Back to the Beach since it takes place in my training grounds. The trails were awesome today and for those that have not run in Stony Creek Metropark, this allows you to see a lot of the park. Well organized race from the beginning to the end and Joe, the race director always does it from the heart. He's a runner so he knows what we like. Short course from my GPS but I don't rely on my GPS when it's on trails and almost impossible to be correct. This was half #25 for me and I'm glad it was one in my backyard. I will do this one again for sure. It's so fun! Race registration was through Active and it was easy as always. Just fill in your information and you were good to go. The race also has a website with all the information you need to know about the race. The race had several options for packet pickup. They gave you TWO Saturdays to pickup early and also pickup race morning. Since this is so close to my home, I pickup up the first weekend. Packet pickup is located at the Utica location of Hanson's Running Shop. Yeah, that Hanson's. Packet pickup was well organized and the volunteers were ready for the runners. You got your race glass, tech shirt, bib and timing chip. Hansons uses the really old chip technology that goes on your shoe. I've never understood why they don't upgrade to the current technology but it works and that's all that matters to me. As I said, you could also pick up your packet race morning and it was not overcrowded then either so both ways were very organized. If I didn't live close, I'd have no worries picking up that morning. The start area was very organized and the race had sponsor tents, port-o-potties, and was getting ready for the finish line food which was in the same area. 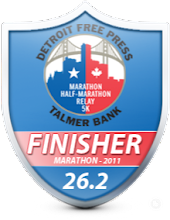 The race director is also the organizer for the Detroit chapter for Medals 4 Mettle which repurposes race medals to sick people at hospitals. A great organization. I just can't get myself to donate my medals just yet even after 25 half marathons. I saw Joe, the race director, working hard and asked him for a quick picture. Joe was nice enough to get my bib #25 for my 25th half marathon. How awesome was that? He didn't have to do that but that's just the kind of guy he is and, those that know him, know he has a passion for this race and does a great job. 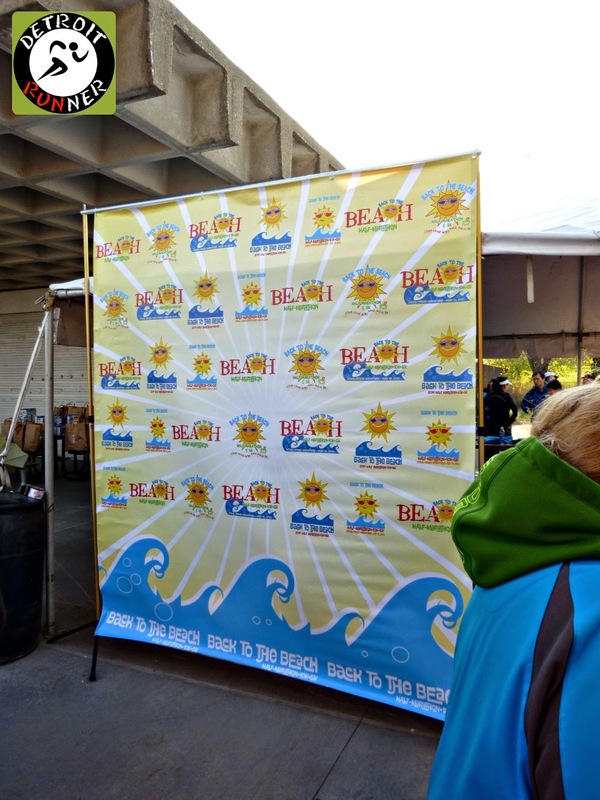 Also new this year(well maybe last year but I didn't race last year) was a photo opportunity with a race backdrop and you could get pictures. I love this idea and think all races should do this. The start area had plenty of port-o-potties but also offered real bathrooms which is always a big bonus at races. Real backrooms too - bonus! I had one goal for this race which was to finish. I only ran 3 miles in the last 10 days due to an injury and so I figured it would be a really slow half. My legs overall were feeling pretty good and I'm happy they held out for the full race even though I did struggle a bit. My plan was to take it easy, walk if I needed to and not get hurt more. I accomplished that(I think) and was happy that my time did not suffer too much. As you can see, when we got to the largest hill on the course, we decided to walk up it and not push it. I was not interested in getting hurt to save 60 seconds and my running buddy Kevin is running a freaking marathon in 6 days so he was in for walking it too. Out of necessity, I walked a little in the last mile since my IT band was acting up but considering I was thinking I'd be at 2:30 finish, I was really happy that I didn't feel terrible and still finished in a decent time for me. We got lined up for the race. There were a lot of us and we were ready to run. The race ran through the paces before the start to make sure people were lined up properly and even though I planned a slower race, it's appreciated especially in a trail race when it's more difficult to pass. Note: When I take pictures during the race, I don't change my pace or stop in the interest of safety. I just keep running and I get what I can get from the pictures. Some come out better than others but they give you a great idea of what the course is like. We ran in the back of the first wave which was perfect. It was a perfect day for a half marathon and the temperatures started in the high 40's. This was so much better than the last couple years when it was 20+ degrees warmer at the start. The weather definitely made the course feel easier than when I ran it in 2012 even though it's not an easy course. The course started out on a grassy area which is perfect to get used to running. I was so happy to stay off the pavement as much as I could with about 60% or more of the race on grass, trails or dirt roads. The course was marked exceptionally well with not only flags and signs but also spray painted arrows which makes it that much easier to not get lost. There were no spots where I felt you were wondering where to go. The course management was awesome! As you can see, the hills started pretty much right away which makes the course a tougher race. Of course, there is a mix of concrete mixed into the race as well so if you were looking for a PR, the asphalt parts were good places to speed it up to improve your time. We took our time and did a nice pace and tried to just stay consistent. We start the trails with the Trolley trails in Stony Creek which really helps get you tired right from the start. Haha! The trails there are awesome and so much fun to run. Before I knew it, we were back on the path and heading outside the park. Since we run this park all the time, it's nice knowing where you are in the park. The next section takes you towards the neighborhood outside the park. 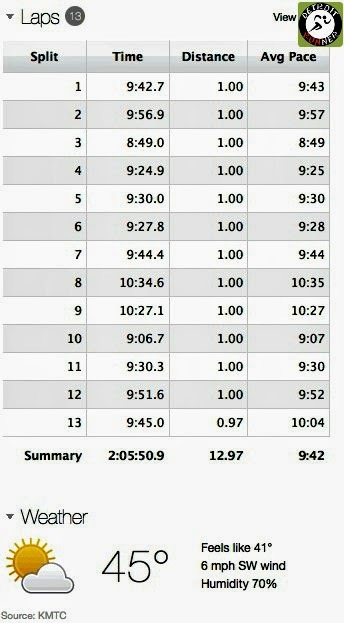 Below is a stretch of the race that I actually love running during training. While it's not that hilly, it's a fun portion where you run over several wooden bridges until you hit the main road. I noticed the race had numerous port-o-potties throughout the course which is nice for those that need it. At a little over four miles, we make our way to the dirt roads for several miles. We were warned that the roads had tons of potholes. While there were potholes, it was nothing what I was expecting and there really were only a few places that they were really bad. Police were also directing traffic as we got onto the dirt road since it's a busy intersection. As you can see below, the dirt roads were not bad. I was pretty happy with their condition actually and it was a nice run in the country even though we were close to the city. Just as we got back into the park, there was a timing mat for the half way split. I hit it a little over an hour. They also had an aid station here as well as a Jello Shot and Beer station. Crazy huh? No I didn't partake in the liquor but might of if they had been at mile 12. We still had a lot of running to do. Oh yeah, plus it was freaking 9am. Lol. The next set of trails are the mountain bike trails and I'll be training on these quite a bit this summer preparing for a full and 50k trail race. The park really has some awesome trails here and I love that I'm not far from the park. Mile 8 is the toughest of the course and much of it is up and up and up. I walked most of it and it really helped me keep going the whole race. There's always people there cheering on runners here to help get them up the long hill. You can see from the elevation chart where this is since it sticks out or really up. Marked roots - how awesome! Once out of the trails, we head back to the path for a few miles. This is where I run all Winter since the park plows this path in the winter. It's a great path to run or bike all year. The water is pretty high this year for the lake and I've not see it so high. We past the mile 10 mark and I thought to myself how hot it was in 2012 at this park. It was so much more enjoyable this year. Of course, since I run here often, I knew there would be more hills even on the path. We take a turn off the asphalt path and back to grass. I was so happy to get back onto the grass and the park had a path cut right where we needed to continue running. The race had the below sign all over the course to keep you going the right way. The race did a fantastic job with marking. I would have never thought to turn right in the photo below but that's one of the reasons that makes this race awesome! I was starting to get really tired about this point too so I had a little bit of walking in here. We came around a couple more corners and the finish line was there! The aid station and volunteers were awesome. They had water and Gadorade at every aid station and also had GU and GU Chomps in two locations. In addition, they had a Jello Shot and Beer station. This year again they had two cold towel stations as well. Given the cooler weather I didn't use it this year but, boy, were these great last time I ran this race. Finally at the end, there was a station giving out Hawaiian lei's for you to wear as you crossed the finish line. After we finished, a volunteered handed you your medal and then there were volunteers there to cut off your timing chip since they were put on with zip ties. A really fun feature that every race should have is a race background so you can take a picture. It's a fun idea and I see more and more races doing this. The race had results there for the half, 10k and 5k but my time was not posted yet. No worries as when I got home and looked, the results were already posted online. 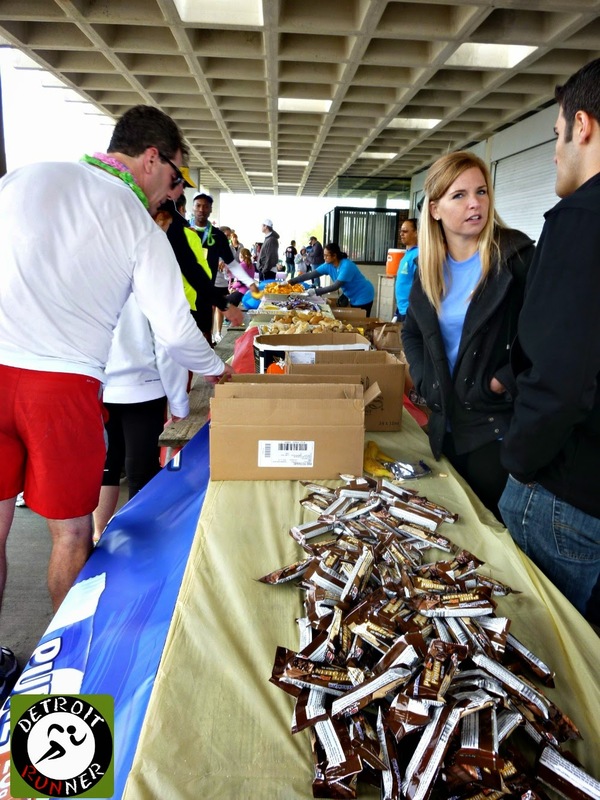 We then got some finish line food including protein bars, bagels, bananas, pop tarts and orange slices. You could also get an after race massage too if you chose. For the $45 race entry fee + $4.29 online surcharge, I received a nice mix of trails and cement course. The course was mostly closed since it was in the Metropark. 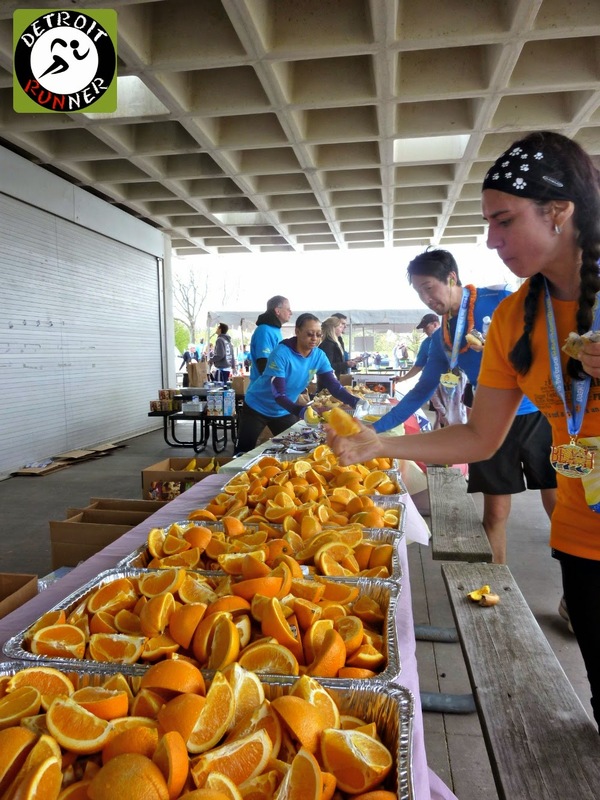 The race was chip timed and there was a good offering of finish line food. You also received a nice tech shirt which I will wear in training. In addition, new this year was a race car sticker. Once again, the race had a glass with the race name on it and finally, they offered an incredible race medal. The medal is not only a great design but the waves look like glass and the "sun guy" spins. I love spinning medals. It's also a really colorful medal too and a lot of thought was put into it. A special note and thanks to Joe, the race director as he got me bib #25 for my 25th half marathon. It was really great of him to do that and it was much appreciated. It made the race much more special for me. The organization was great. The communication on emails as well as their Facebook page was great. Registration was simply and packet pickup was really easy. The start and finish line was well organized and everything was easy to find. The course was marked perfectly. There was plenty of parking as well as enough medals and food and bathrooms. Sure the course showed short on my GPS but I have more faith in Joe's ability than my little watch. Read this article to learn more about GPS and you will see why I'm not worried about it especially on trails. Is this a race I would do again? Absolutely. This was actually my second time(#7 and #25 half). 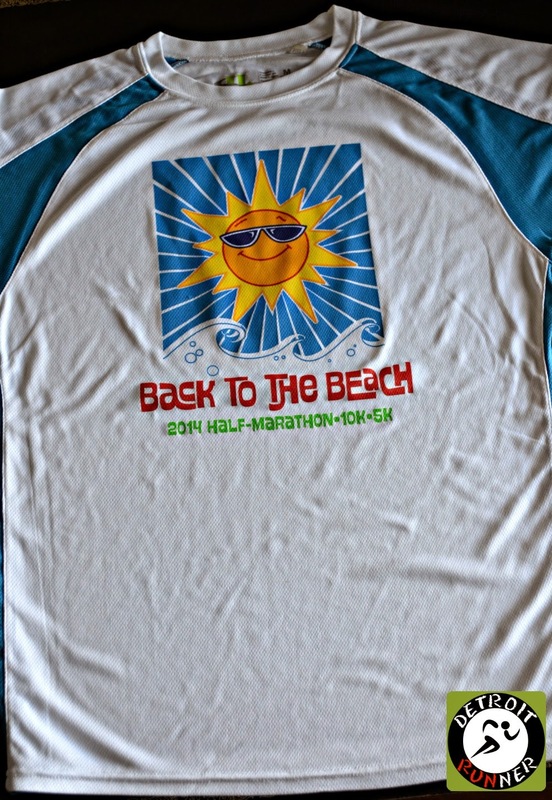 It's a really fun half marathon with a great theme. The volunteers are great. The aid stations are numerous and well organized. The director puts his heart and sole into this race and it really shows in all aspects of the race. He's a local runner and knows what runners like. 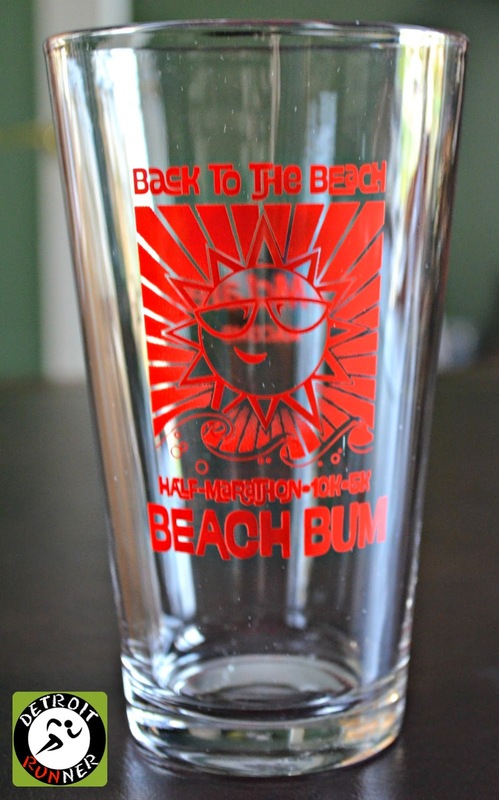 There's awesome race bling and an all around great time. It sells out each year and you can certainly see why. 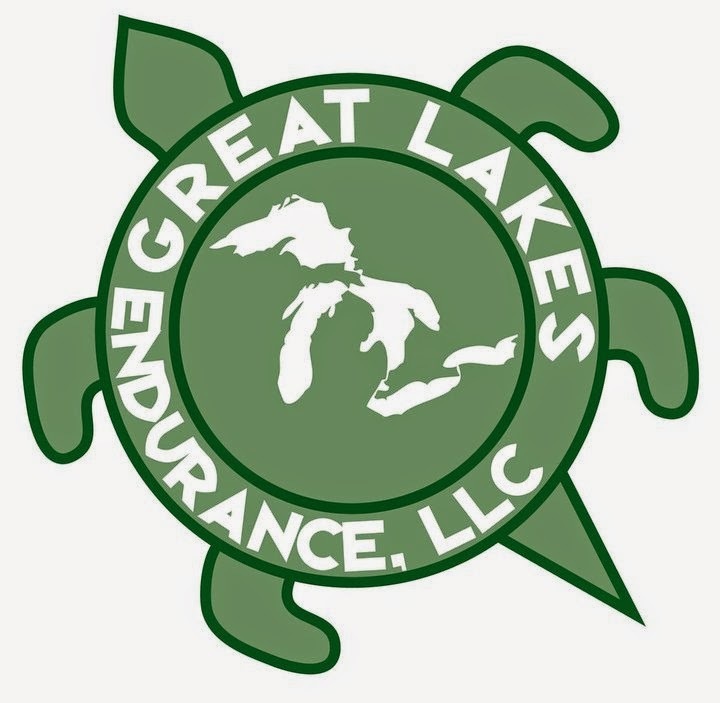 If you have not run this race, sign up next year for a great time. Disclosure: I paid for this race entry myself. All opinions are my own.